He's still a rat faced troll but dammit if his songs aren't getting, well, I can't say better because I still unhealthily adore Shout It Out but, no, his songs are getting better in the way that, say, Jubel, is a better song than 3 Second Rule, but not one that I like more. Okay, this is pretty good production wise. It's like Reece Mastin is actually putting soul into this. I was prepared not to like it but... this song has grown on me. 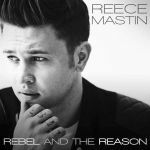 Finally something worth listening from Reece- not a bad production, meanigful song. His voice has a quality to it, reminds me a bit of Hozier (strange I know). So I now like it, and its catchy too.